Home Ocean Facts What is bathymetry? Bathymetry is the study of the "beds" or "floors" of water bodies, including the ocean, rivers, streams, and lakes. Bathymetry map of East Flower Garden Bank. 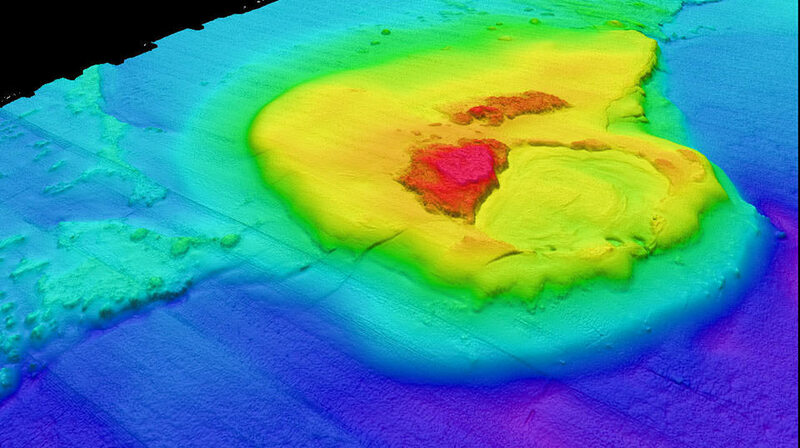 The term "bathymetry" originally referred to the ocean's depth relative to sea level, although it has come to mean “submarine topography,” or the depths and shapes of underwater terrain. In the same way that topographic maps represent the three-dimensional features (or relief) of overland terrain, bathymetric maps illustrate the land that lies underwater. Variations in sea-floor relief may be depicted by color and contour lines called depth contours or isobaths. Bathymetry is the foundation of the science of hydrography, which measures the physical features of a water body. Hydrography includes not only bathymetry, but also the shape and features of the shoreline; the characteristics of tides, currents, and waves; and the physical and chemical properties of the water itself.